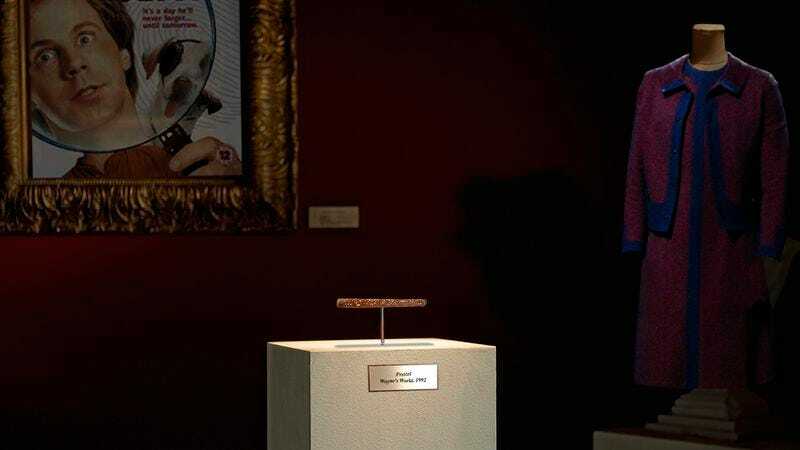 If you are even a slight Dana Carvey fan, you better be sitting down for this news: After being kept in a private collection for over two decades, the pretzel that Garth chokes on during the tiki bar scene in Wayne’s World has just been added to The American Dana Carvey Museum. The pretzel will be the centerpiece of this fall’s exhibition, “The Physical Carvey,” which also includes a 3D display of “Choppin’ Broccoli” and the padded muscleman suit worn by Carvey’s iconic SNL character Hans. The San Francisco–based museum will keep the pretzel in a climate-controlled case in order to preserve the exact discoloration and warping it endured from landing in Garth’s tropical-themed cocktail. Even for a museum known to set a pretty high standard, this is a groundbreaking achievement. In fact, the pretzel alone puts this upcoming showcase on par with the very popular “Mr. Carvey Goes To Washington” exhibit, which ran during the 2012 election season and featured dueling holograms of Carvey’s impersonations of George H.W. Bush and Ross Perot. We can’t wait! But in the meantime, fans are encouraged to check out the fully restored Church Lady piano, on loan from The Dana Carvey Institute and available for viewing between now and August 31.